In this mini-retreat, we love watching paint dry! Looking for templates so you can try it yourself? 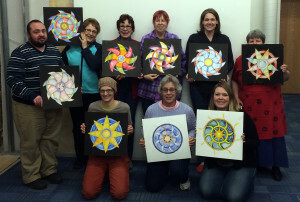 Templates are at the bottom of the Mandala Mini-Retreat class page. Last weekend’s mini-retreat on Mandalas for Prayer and Meditation at Wet Paint was a wonderfully relaxing way to spend a Saturday afternoon! 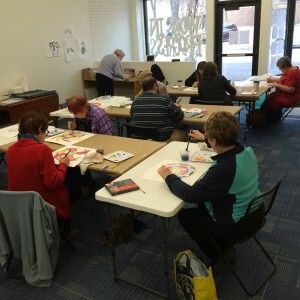 If you have taken this workshop and want to make another mandala, or if you have watercolor supplies and just want to make one on your own, I have uploaded the templates we use in the workshop as a starting point to the Mandala Mini-Retreat class page. Scroll down to the bottom to see thumbnails and download links for eight templates you can use as a starting point for your own mandala. The templates are purposely simple, because part of the beauty of these mandalas is letting the watercolor run and mingle, and it needs a little space for that to happen, but you can embellish them as much as you like. 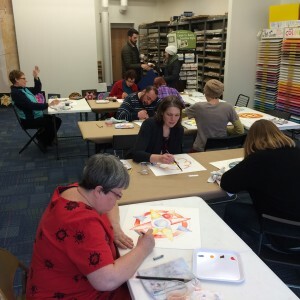 Isn’t the new classroom space at Wet Paint lovely? In class, we work on 16×16″ squares of watercolor board (which you can buy at art supply stores). You can also use watercolor paper. (I use board in class so people can display their mandalas without framing.) To print the templates for class, I take them to my local copy shop on a thumb drive and ask them to print them so they are about 14″ wide. The files are not high-resolution (to make them download fast), but if they get “the jaggies” from being blown up, it usually doesn’t matter, because you are just tracing them as a starting point for your design. Even though we start from the same few templates, each mandala is unique and personal by the time we’re done. Beautiful!